I went back to Spring Gully Conservation Park for a third activation this morning. The real purpose was to try out a home brew three band end-fed antenna. The antenna is currently designed for 30, 20 and 17 metres, but I will probably extend it to 40m when I get home. One design fault with the antenna is the running insulator which is in the 20 metre section does not allow for centre mounting. I will move it to the 30m section which will ensure the antenna is mounted at the top of the squid pole in the centre and not off-centre in the 20 metre section. The current arrangement means that too much of the 30m section hangs too low which reduces efficiency. Andrew, VK1NAM, inspired me to build this by his excellent article on a half-wave end-fed system he built. I tried out the 30m antenna. I had qso’s on 10:115 ssb with VK2AXB, Grant at Orange 5 and 8 and 5 and 2; I could hear VK4NZ, Jim in Mackay, Qld, 5 and 1, but he could not hear my signal; VK4JWT, John in Brisbane was 5 and 6 and he gave me 4 and 1; VK3AAU, David in Warragul very kindly drove to a high point to work me (away from the noise): he was 5 and 8 and gave me 4 and 7 and finally, VK3SQ, Geoff, at Beechworth 5 and 8 and 5 and 6. I used my FT817 at five watts and the SOTA tuner which will handle six watts (parallel-tuned) for the lower bands. I did not post an alert in case all went pear-shaped. It didn’t and the antenna could be useful on a summit. Later in the day we held a mini-hamfest in Clare. I had already arranged to meet VK5KC, David, who, with his wife, came to Clare for a family weekend. 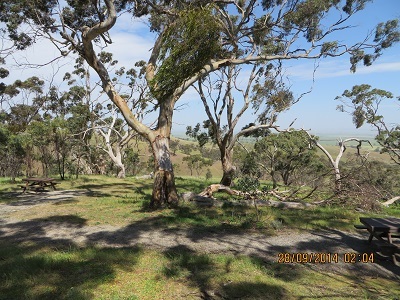 Later in the day I received a call from VK5PAS, Paul, who was driving towards Jamestown to activate some summits and parks and indicated he would activate Spring Gully Conservation Park as he was passing through Clare. Earlier in the morning I had met with Ian, VK5CZ, tractor mobile, who was working. And later, with the aid of the Spencer Gulf Repeater (146.700 – 600 KHz) and 146.500, we arranged to catch up at the end of the day. The meeting place was in the Clare Caravan Park and a picture was taken, which is highly likely to appear on Paul’s Blog. Sadly our visit to the Clare Valley will come to an end tomorrow as we turn around and drive back to the Adelaide Hills and home. 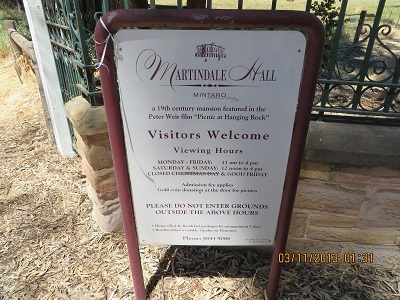 I have had a great time climbing Mount Bryan, visiting Parks, socialising and playing radio. 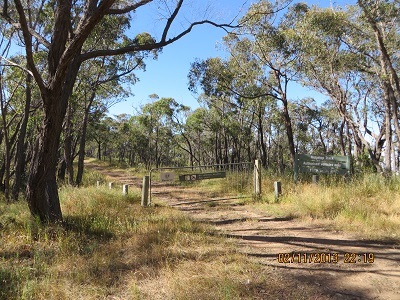 Spring Gully Conservation Park is about 12 kilometres from Clare and about five from Sevenhill. 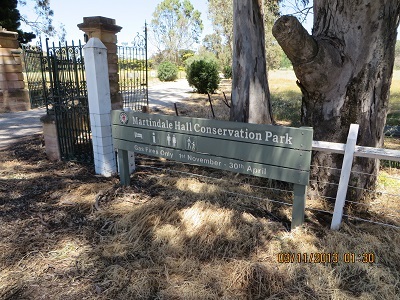 It preserves bushland in the midst of farms and vineyards. The park is 400 hectares. 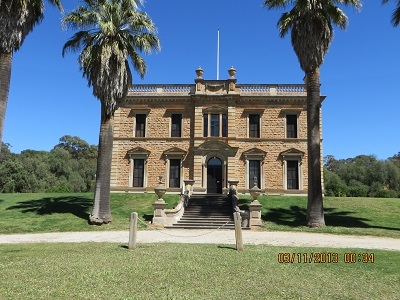 It was originally 15 acres and gazetted in 1962. 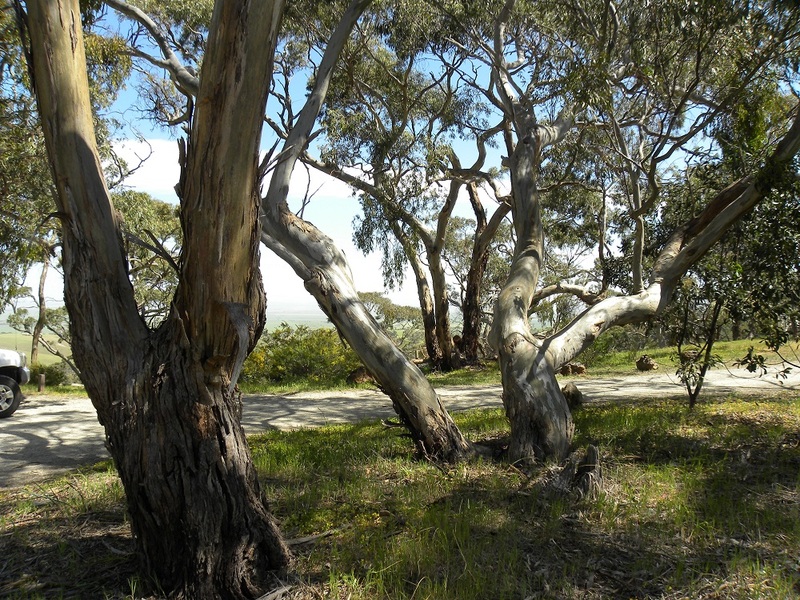 The Park was established to conserve ‘the only stand of red stringy-barks in South Australia’ (Friends of Spring Gully Conservation Park, 1988). These trees are relics of an earlier wetter period and can also be found in the Grampians National Park, Cape Otway (Victoria) and near Dubbo in New South Wales. We also collected the latest brochure from the Information Centre. There are not too many changes but the walks are now shown on the map. We returned to the Park today (28th September 2014) and took a few more photos, including the red stringy-bark eucalypts. This was my second activation. I first activated the Park on the 3rd November 2013 (see my blog – An Alternative to a Buy and Sell). I enjoyed my activation late in the afternoon making 19 contacts in VK2, VK3 and VK5. Conditions were good. I was on the air at 06:35 UTC on 7.100 and enjoyed the following contacts: VK3YSP/P, Joe at the Organ Pipes National Park, VK-FF 627; VK5NQP, David (thanks for spotting me); VK5IS, Ian; VK3FQSO, Amanda; VK5GJ, Greg; VK5AW/M, Adrian mobile near Loxton; VK5GJ, QRP, Greg trying out his MST400; VK5YX, Hans; VK5VH, Ron, a great contact with Ron using two antennas from his unit, the second being just one metre long; VK3AFW, Ron; VK3ZZS/P, Colin; VK3CVB, Brenton; VK3HEX, Peter; VK2CCJ/P, Cliff camping near Hillston; VK5LY, Larry; VK5PAS, Paul; VK5WG, Nev; VK3FKJC, Kevin and at 07:54, VK5AV, Bernard. Thanks to all who gave me a call. It is greatly appreciated.